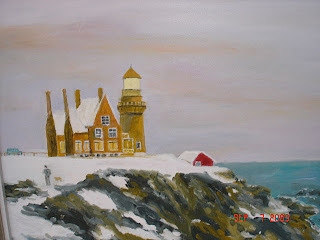 This painting is one that I produced between the larger painting of Block Island Light and the painting I am currently working on. 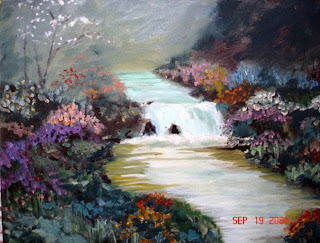 This work is a 9X12 oil on canvas. My dad named this cottage which is now my year round home in Westford "Sunset Manor" because the sun actually sets behind the cottage over Conscience Hill. Although certainly not a manor in the true sense of the word it was a great second home growing up as a kid and a wonderful spot to retire to as my full time home in Westford. It is hard to believe I have lived in this spot for 42 years. In this composition I tried a new subject and an early morning sky. This is a 16X20 oil on canvas. I am pleased with the effect that I produced on the cliffs. I would like at some point to alter the composition and paint a darker, stormy sky as well as lowering the horizon line to give a greater impression of depth. My production this summer has slowed a bit as I enjoy spending time outdoors . 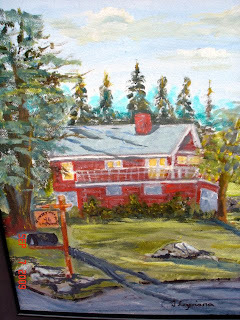 My next painting is a relatively quick rendering of my cottage home in Westford.